Según los últimos rumores, Assassin`s Creed Comet sería un juego destinado para ps3 y Xbox 360 en el que encarnáriamos a un templario llamado Shay. El periodo histórico en el que se desarrolaría sería, de nuevo, la Norteamérica de mitad del siglo XVIII. Incluso, según nos cuentan, el juego tendría mucha semejanza con lo ya experimentado en Black Flag, pudiendo navegar y comerciar libremente por un mundo libre. La otra gran noticia reside en que este título contaría con cameos importantes como los de Adewalé y Haytham Kenway, sirviendo de enlace entre Freedom Cry y Assassin`s Creed III. Poco más se sabe, pero estaremos atentos a nuevas filtraciones y rumores. 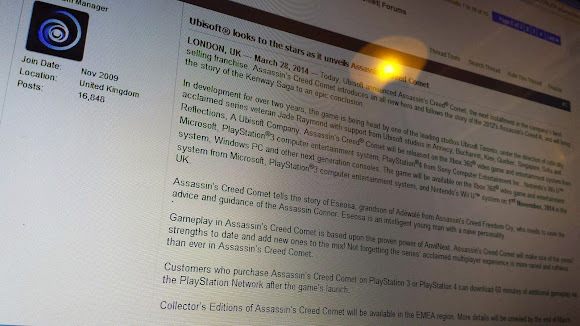 According to recent rumors, Assassin`s Creed Comet would be a game designed for PS3 and Xbox 360 in which we interpret a templar named Shay. The historical period that would be developed would be, again, half of the eighteenth century in North America. Even, the game would have much similarity with already experienced in Black Flag, being able to freely navigate and trade in an open world. The other big news is that this title would have important appearances as Adewale and Haytham Kenway, acting as liaison between Freedom Cry and Assassin`s Creed III. Little else is known, but we will look for new leaks and rumors.